green note with a mild sweet after taste lingering on the tongue. Organic Bai Hao tea has a very appealing chestnut flavor, mellow and sweet taste as well as excellent durable infusing resistance. If you want to try a new green tea with a slightly complex taste, it will not let you down. 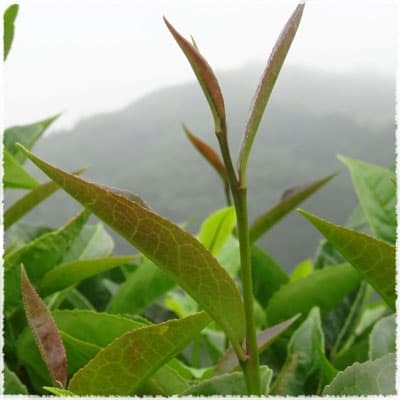 The main production points of this kind of Bai Hao tea include fixation, rolling, and drying, giving the dry leaves their straight needle shape. 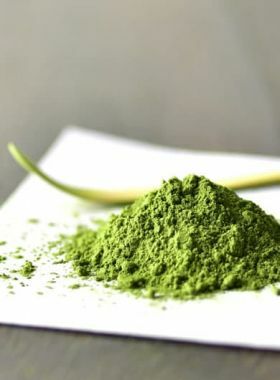 Rather than the usual grassy aroma found among green teas, this one carries a vague, sweet millet note, which when brewed becomes a fresh corn aroma and a mellow, smooth mouthfeel. 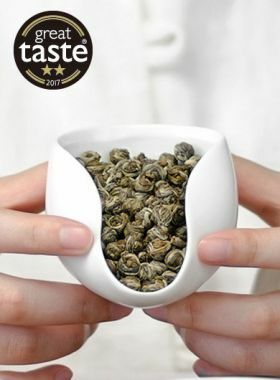 The tea itself has a deep, sweet flavor, almost fruity up-front with a lingering cool aftertaste that can be felt on the tongue and breath like mint; it gives a thicker mouthfeel when compared to other green teas. 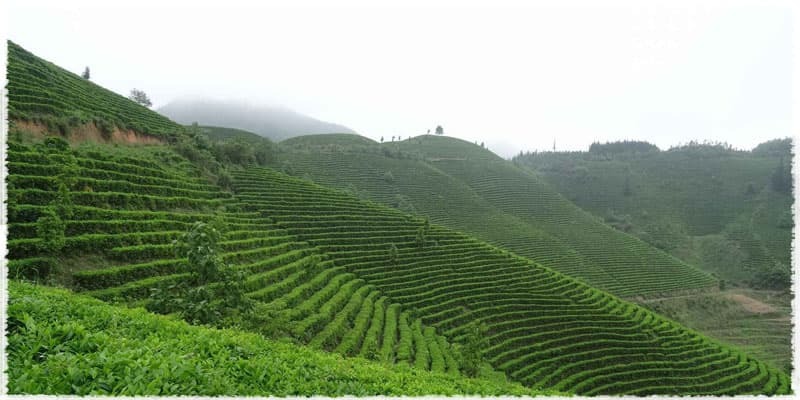 The Yaming Bai Hao tea garden covers a total area of 1000mu within a mountainous area of elevations between 500 and 1200m. The garden is surrounded by forests and is often shrouded by clouds and low mists during the evenings and mornings, which prevent the majority of the harmful effects of harsh sunlight; in turn, this stimulates the growth of the tea plants and increases the amount of amino acids and chlorophyll concentrated in the buds and leaves. 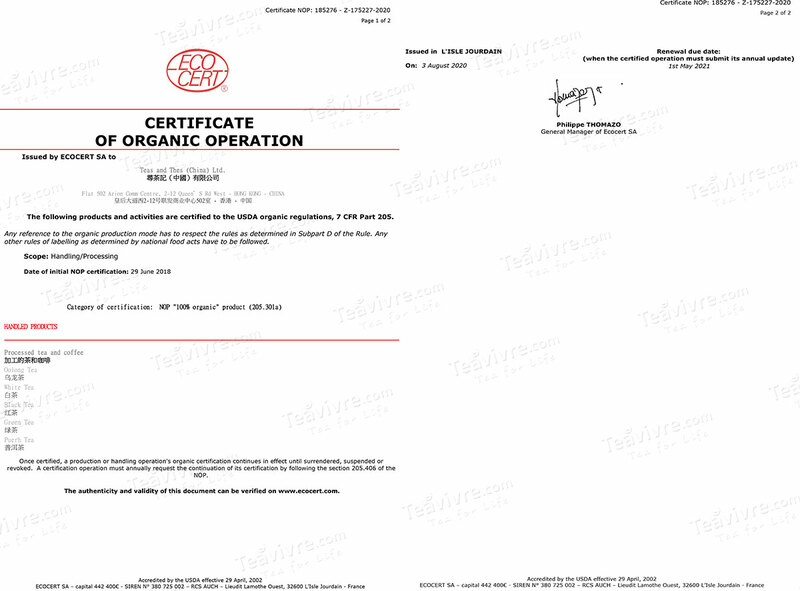 To ensure the highest quality of the tea, chemical fertilizers and pesticides are strictly forbidden in this garden: only sheep and cattle manure are used. 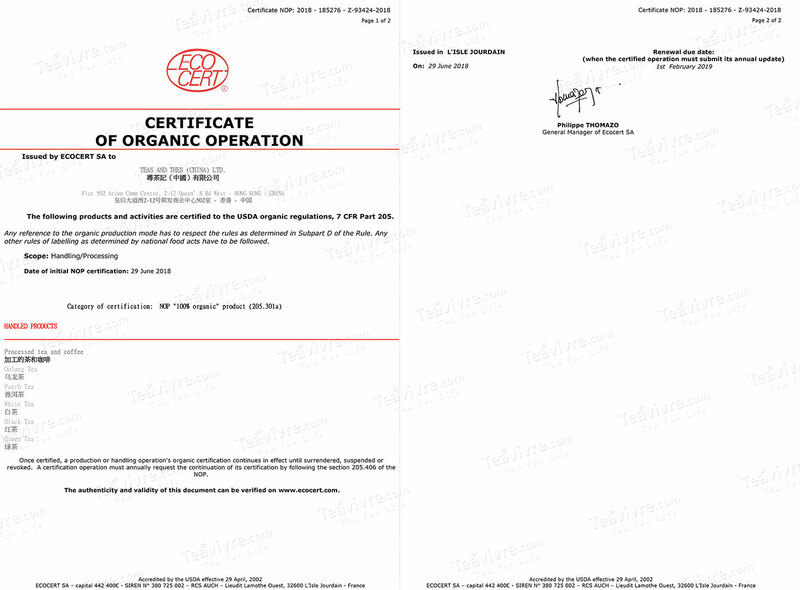 Because of this, the Yaming tea garden was authorized in 2015 to be able to label its products as USDA Organic. 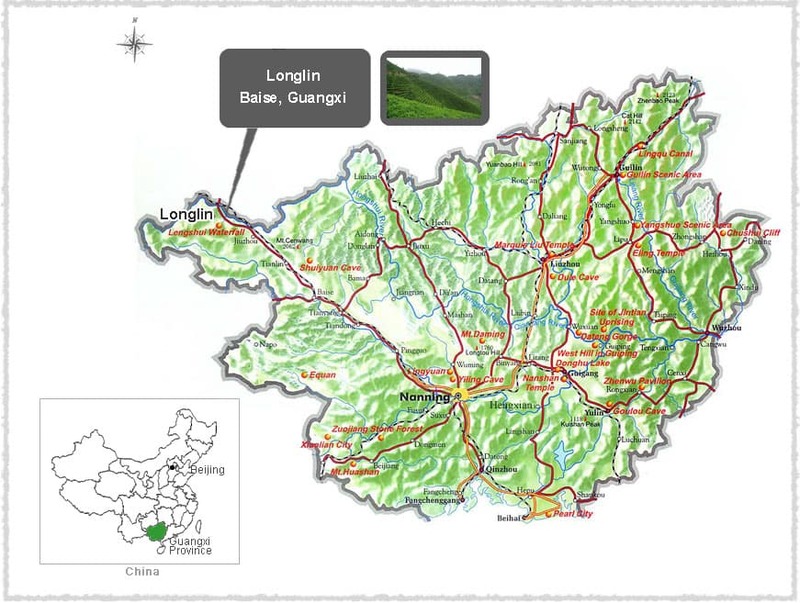 While China is widely known as the original home of tea production, Bai Hao traces its birthplace to Guangxi. These tea trees are commonly grown in the high mountains of the province where altitudes reach between 800 and 1500m, perfect for this variety of tea. On average, this area experiences an annual precipitation of 1500-2000mm, with an average annual temperature between 16 and 23°C. In Asia, it is said that the Bai Hao tea tree is the only variety with leaves versatile enough to be used for all six basic tea types: green, white, black, yellow, oolong, and pu-erh. 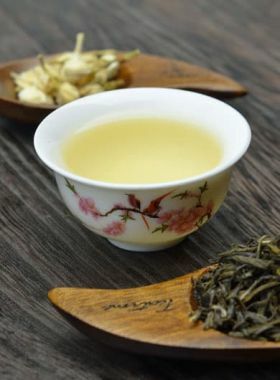 The Bai Hao varietal belongs to the large-leaf species of tea tree, and as such has very elastic, tender yellowish-green leaves with a fresh natural scent. 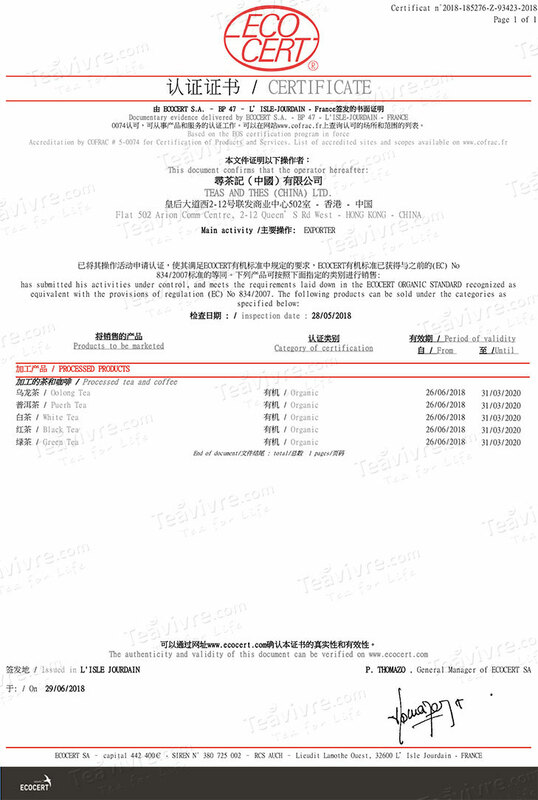 Bai Hao tea is rich in polyphenol, amino acids, and pectin: one test shows that a spring-picked Bai Hao tea of one bud and two leaves contains 3.36% amino acids, 35.6% polyphenol, 4.91% caffeine, and 182.92 mg/g of catechinic acid. Since 1964 a larger number of wild Bai Hao trees have been found growing in the Lingyun County of this province, with the largest one measuring almost ten meters high with a trunk 25cm across. Its dense canopy reaches across 6.38m, with leaves up to 13.3cm long and 4.7cm wide. Bai Hao tea is also called “Ling Yun Bai Hao”, mostly due to its leaves and the downy appearance of its buds. This tea’s jade-green color, soft fuzz, full-bodied fragrance, mellow taste, and durable infusion resistance are the five features by which it is renowned both at home in China and abroad. Gold and silver medals earned respectively by black and green varieties of this tea in the Wuhu International Tea Expo in 2002.